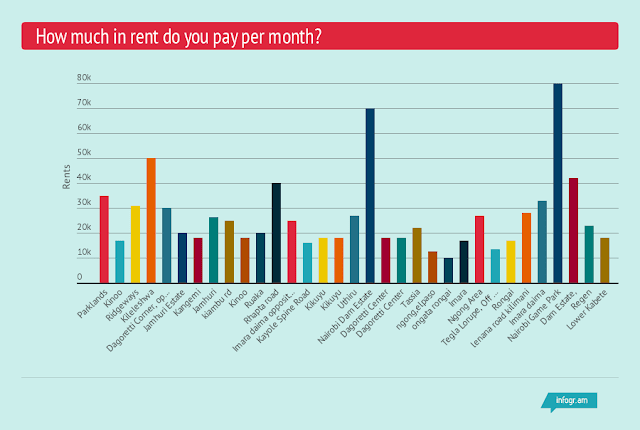 Turning to pricing, the price of 1 bedrooms ranges from Kshs. 10,000 in Rongai to Kshs. 40,000 in Westlands. Imara Daima ranges from Kshs. 13,500 to Kshs. 17,000, while Kayole offers a 1 bedroom at Kshs. 17,000, Lower Kabete and Kangemi at Kshs. 18,000, Jamhuri at Kshs. 20,000 and up at the road at Dagoretti Corner at Kshs. 30,000. 2 bedrooms range from Kshs. 16,800 in Kinoo to Kshs. 50,000 in Kileleshwa. In between, Rongai comes in at Kshs. 17,000, Kinoo and Dagoretti Corner at Kshs. 18,000, Ruaka at Kshs. 20,000, Kinoo Regen at Kshs. 23,000, Imara Daima and Thindigua(Kiambu Road) at Kshs. 25,000. Ridgeways, Imara Daima and Parklands come in at between Kshs. 30,000 and Kshs. 35,000, while Kileleshwa tops up at Kshs. 50,000. 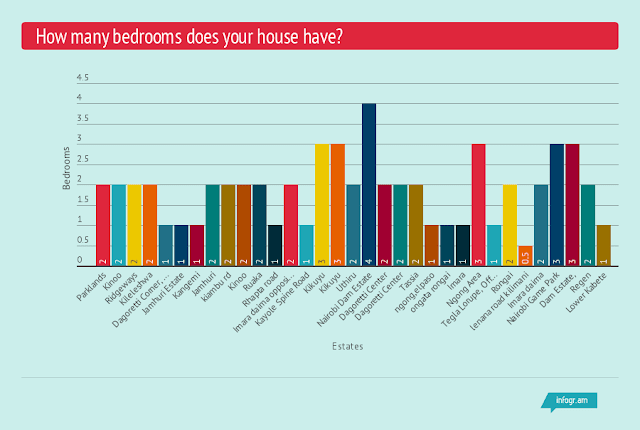 For 3 bedrooms, we have 2 respondents from Kikuyu who both lease at Kshs. 18,000, which incidentally is cheaper than majority of the bedrooms. The other three go for KShs. 80,000 in Langata, Kshs. 42,000 in Dam Estate and KShs. 27,000 in Ngong/Karen. Our sole 4 bedroom in Langata’s Dam Estate costs Kshs. 70,000, while our sole bedsitter in Kilimani goes for Kshs. 28,000. Security is among the top concerns in the city. Recently, we had an article chronicling insecurity issues around Uthiru and Kikuyu(includes Kinoo). Those staying in Imara Daima, Kiambu Road, Dagoretti Corner, Rongai, Tassia and Parklands rate their neighbourhoods as very safe. Not surprising, those in Kikuyu, Kinoo, Kayole, Ruaka, Uthiru rate their security as okay. Jamhuri, Kileleshwa, Langata and some Imara Daima residents also feel their security is okay. 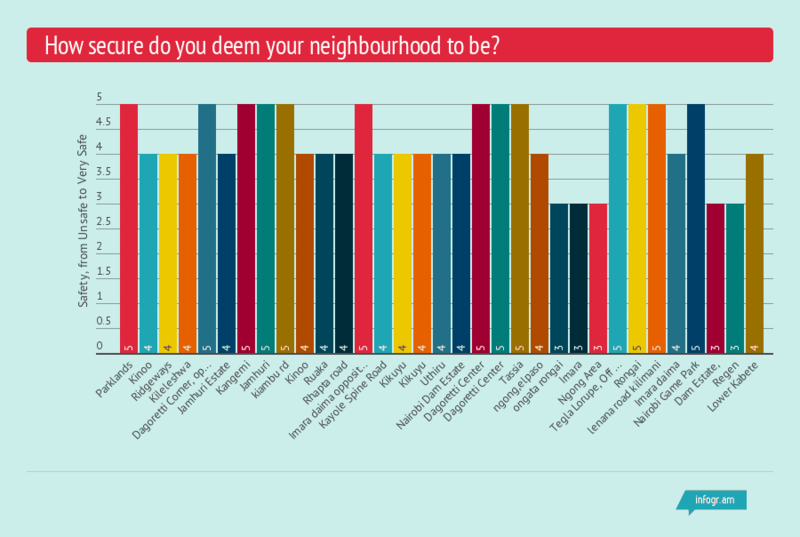 Rongai and Ngong Residents rate their security as somehow safe, while Imara Daima completes its straddling of the spectrum by making an entry here too. 15 out of 33 respondents felt their security was okay compared with 13 out of 30 who felt very safe and 5 who felt somehow safe. Interesting enough, when we flip the question to when residents felt safe coming in at night, residents of okay areas including Kinoo, Kayole, Uthiru and Langata felt confident coming in at any time of the night. This may probably vary due to presence of guards, and closeness to the main road. From the “very safe” areas, those in Dagoretti, Parklands, Tassia and Kikuyu feel they can come in any time. Those in Ruaka, Ruaka, Rongai, and Jamhuri feel comfortable going home between 11 PM and midnight. In Imara Daima, Kinoo and Kileleshwa, residents feel confident coming in at between 8 PM and 10 PM on the latest. 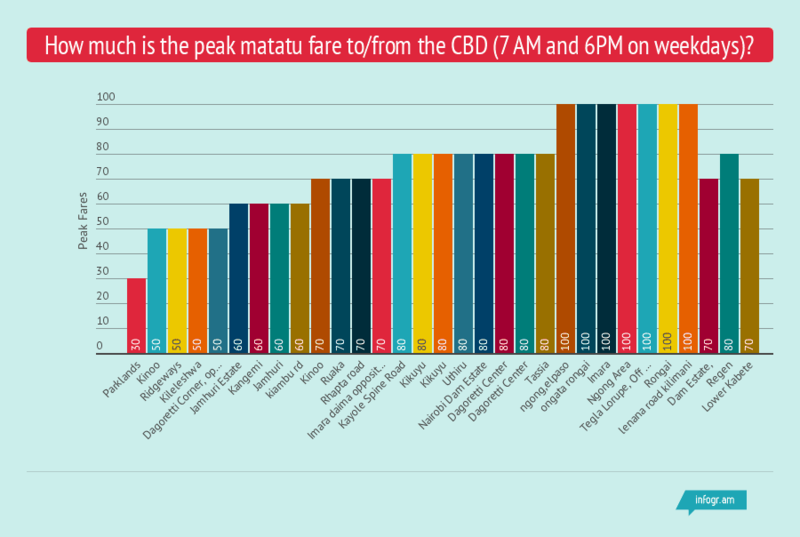 While transport costs make for a good argument on the attractiveness of living in a place, many people may tend to overlook these as the fare varies mostly depending on competition(story for another day). Imara, Ngong and Rongai fares to the CBD peak at Kshs. 100, while Kikuyu, Kayole, Dagoretti and Kilimani come in at Kshs. 80. Kinoo, Kangemi and Jamhuri come in at between Kshs. 60 and Kshs. 70 while Parklands and Kileleshwa range at Kshs. 30 to Kshs. 50. In addition to the above graphs, you can also explore data for the various estates mapped out below. The larger the circle, the larger the rent. Mousing over the circles, or tapping on your mobile phone will give more information including the location, amount of rent, number of bedrooms and what the people renting perceive of the safety of the neighbourhood. And if you haven't filled the survey, here's the form.